In addition to performing jazz on recordings, in concerts and clubs, Eric Allison provides a wide variety of music for private parties, including weddings, corporate/institutional events, charity affairs, etc. The WONDERLAND SWING BAND is an exciting larger band featuring a full horn section and vocals, playing classic selections from the Big Band Era (Glenn Miller, Count Basie, Duke Ellington, Tommy Dorsey) and repertoire of the recent swing craze (the "Jump Swing" of Louis Jordan, Louis Prima, Brian Setzer, Big Bad Voodoo Daddy). The band often dresses with a 40's look: crazy neckties, suspenders, and black fedora hats. For the best in sophisticated vocals, sultry or swinging, Canadian-born CHERYL FISHER is the featured singer with the Eric Allison Band. Performing at the Montreal Jazz Festival with her own group in 2001, she was billed in their program as "one of the greatest female singers in the history of Canadian Jazz." Performing for private parties, Cheryl draws on the classic repertoire of the American popular songbook (George Gershwin, Richard Rodgers, Cole Porter, Jerome Kern) and carries on the great vocal traditions of Billie Holiday, Frank Sinatra, and Ella Fitzgerald. 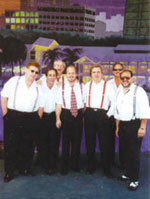 The ERIC ALLISON DIXIELAND BAND plays authentic New Orleans music and Dixieland Jazz with a Mardi Gras party spirit. With banjo, tuba, parade drums, and lots of horns, this band has the flexibility to move about and perform in different areas of the same venue, or even to march in the great New Orleans street band tradition. The band wears matching vests and caps. Upon request, in addition to Swing, Standards, and Jazz and Blues, we can provide an even wider variety of music including Latin, Rock, Pop, Motown and Disco. Whether background music to create just the right atmosphere or a party band to rock the house, Eric Allison Bands can help make yours an event to remember.